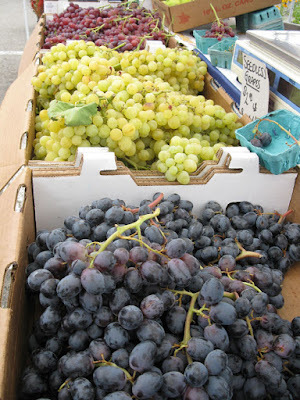 I went to the Santa Rosa Original Certified Farmers Market with my hubby yesterday and picked up some cherry tomatoes and apples from Ridgeview Farms, and delicious grapes from De'Santis. I probably should have waited on the apples, since I will be in apple heaven this weekend at the Gravenstein Apple Fair. This bento was simple and quick to prepare. I used my little bunny container, and so of course I had to use a bunny pick. In this snack bento: a turkey patty from my bento freezer stash, cherry tomatoes, cucumbers, radishes from Triple T, red pepper slices, and two kinds of grapes. A shot of grapes at the Santa Rosa Farmers Market! Yum. I also made a grape themed manicure, which I entered in a contest of nail designs at The Daily Nail. If you've never seen The Daily Nail, you really should check it out. The woman who does this blog makes a new manicure every day. EVERY DAY! And they are amazing designs. I hope I win the contest! The theme was "Home" and I made vineyards and grapes which remind me of Sonoma County. Thanks Kelly! It's fun to do intricate manicures but it takes so long to wait for the polish to dry. 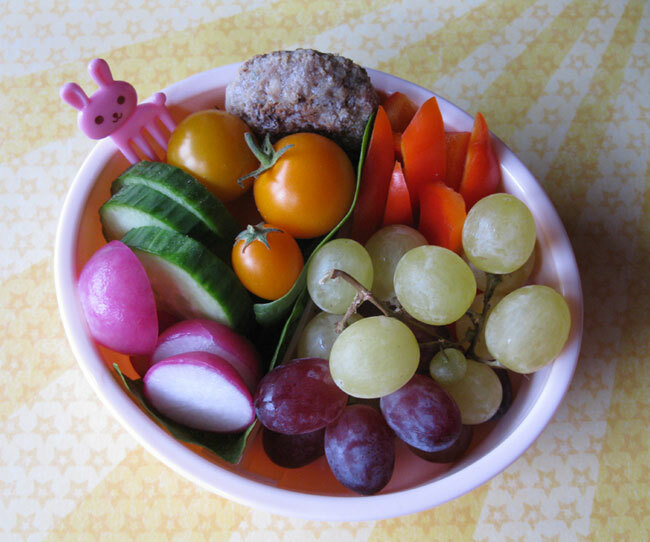 Love the softly contrasting play of pretty colors in this bento, SB! Great manicure inpiration, good luck! Wonderful manicure..i love your fingernails so much...haha. I wish to have this type of manicure EVERYDAY too. 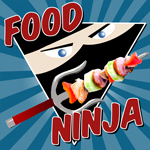 :D Thanks for sharing that link, so impressive by those lovely design. New manicure every day??? Wow! Simple but so colorful and full of fruits! 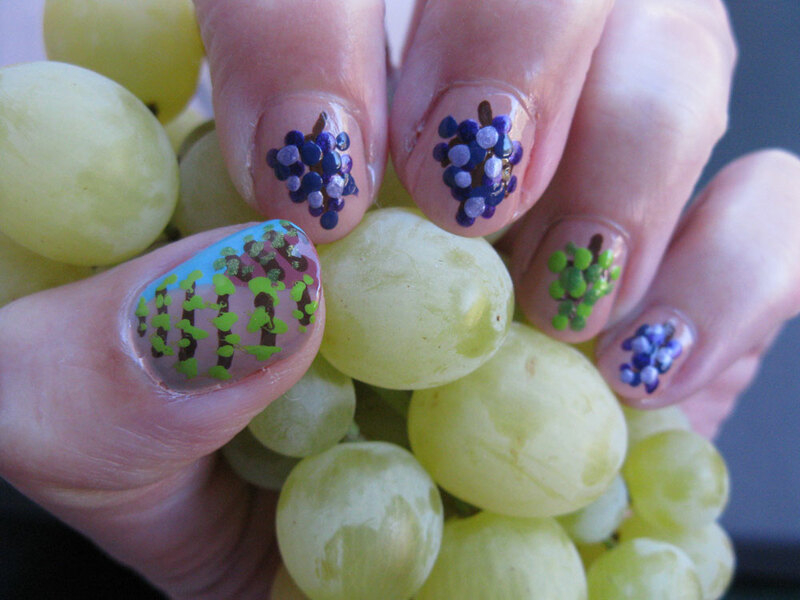 Love it ... and the nail art too, cool! Thanks bentobird! I'm crossing my (manicured) fingers! Hi Emily! Isn't she amazing? I wish I had the time and talent to make such amazing designs. I only do it now and then. Hi sheri! I love this little bunny box, so tiny but just right for a snack. Thanks Lia! It was a quick bento to put together. Summer fruits and veggies make it easy to put together delicious bentos. Cute nails!!! I would love to do something like that but lack the hand-eye coordination to pull off anything but blobs. Have to leave that to my manicurist. 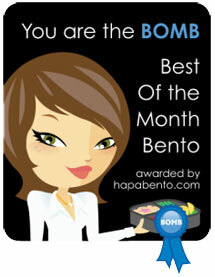 50th Sonoma Bento Post and Giveaway!